DePaul University adjunct economics professor Antonio Morales-Pita thinks the No. 1 issue that dignitaries will discuss at next month’s G8 summit at Camp David is how to grow the world economy – starting with Europe. The most serious problem in Europe, according to Morales-Pita, is to save the European Union, the economic and political union of 27 member of states in Europe. The economy crisis in Europe has been threatened the whole world for more than two years. European countries such as Greece and Spain have suffered from severe debt crisis and unemployment problems. As reported in the New York Times, in last week’s G20 meeting, the International Monetary Fund (IMF) raised more than $430 billion fund to help finance markets to handle new problems from the European debt crisis. The world’s top leaders have pressured Europe to do more to fight the crisis. In Morales-Pita’s view, Mario Draghi, the president of the European Central Bank, has been very effective in making decisions. Draghi made the decision to raise the interest rate to 1.0 percent and helped to ease the Greek’s debt crisis. He has been beneficial for the majority countries. However, there are many political differences and discrepancies among the 17 European countries. It will take times for the decisions to be made and taken. While the European countries are suffering from the economy crisis, some economies are still growing, say China and South Africa. The 2011 gross domestic product (GDP) growth of China is 9.2 percent. The World Bank has predicted an 8.2-percent GDP growth of China in 2012. Zhang Qi, economic commentator and observer at Chinese Law Magazine, said that Eurozone countries should have more cooperation with the “fresh-grown” economies such as China, Brazil and South Africa. Qi thought the Eurozone’s problem should not be the European countries’ “own business.” It will affect the global economy significantly if the problem cannot be well handled. He believed that the U.S. should take the lead in helping the Eurozone recover during the G8 summit. However, Morales-Pita does not think the G8 summit will take China as an example of the growing economy and learn anything from China’s rapid growth. He said he thinks the economies of different political systems can hardly be compared. Morales-Pita gave an example of landing money from the bank. In China, if the country needs a bank to lend, it can order the bank to do so. But in democratic countries, they have to persuade the bank to lend. He said he thinks the government intervention is generally accepted in European countries. But it is the government intervention in the context of democracy. Qi does not think the government intervention in China is something like a “dictatorship.” In his opinion, China has a well-developed market economy for years. The economy is driven directly by markets and consumers’ demands. In fact, Morales-Pita said he thinks the G8 may talk about the government intervention as well. And there will be an increase in the government intervention in Europe. The United State’s history of government intervention can date back to the beginning of 20th century. The government’s role in economy changed significantly during the “New Deal” period to ease the high unemployment rate in the 1930s. In terms of America’s opinion of the government intervention for today, Morales-Pita said there is a tendency of a reduced government’s involvement in the economy. President Obama has spoken in the name of the Congress, but the Congress disagreed to have more government intervention in the U.S. economy. Morales-Pita personally disagreed with Congress’s decision. He said the U.S. should have more government intervention in particular private areas, say health care. He said it is “sad” for him to think that there are still many poor people who have no access to insurance. “That’s something shouldn’t be. This doesn’t happen in Europe,” Morales-Pita said. Many European countries have well-established insurance system. It is one of the reasons of high tax levels. According to Morales-Pita, tax money in European countries is “well used” for education and infrastructure. If the taxes are high, the involvement of the government is high. High tax levels mean more government intervention in the economy. Morales-Pita says what U.S. has to do “should be similar to what the Europe is doing.” More government intervention should be “an idea” for Europe to solve this prolong debt crisis as well. The U.S. is the current leader in the world economy and will play a major role at the G8 summit, Morales-Pita said. In his opinion, President Obama has done a “perfect job” in terms of recovering the economy. 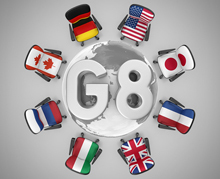 G8 summit attendees will discuss the business together. In the mean time, they would love to develop a “bilateral” relationship and have private meetings. As the U.S. has the leading economy, leaders will want to some face time with President Obama and discuss the solutions of current problems. According to Morales-Pita, the G8 summit may also talk about the unemployment problems. European countries now suffer from high unemployment rates. Unemployment has been growing in most countries. “The unemployment will always be the problem number one in any economy,” he said. The U.S. unemployment rate in March 2012 was 8.2 percent. For the U.S., it used to be 4 to 6 percent. In some European countries, say Spain and Greece, the unemployment rate has gone as high as 10 percent. Morales-Pita said he thinks the increase of government intervention is a way to ease the tough unemployment problem. Private sectors would not create jobs itself. He said it is time for the government to “kick in” and add more jobs by creating infrastructure.